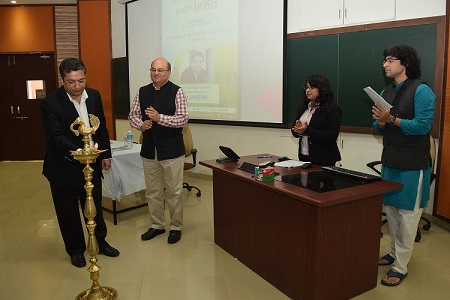 Under the Executive Post Graduate Programme in Management (EPGP) iKON CxO Guest Lecture Series, a talk on Future of Renewable &Solar Energy was conducted at IIM Indore on January 10, 2017. 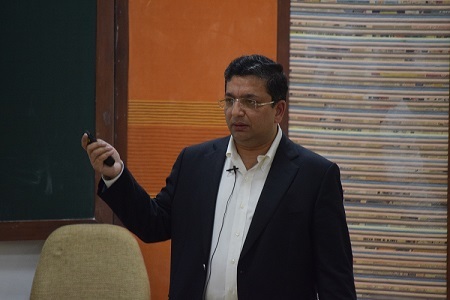 Mr. Sameer Gupta, Chairman and Managing Director, Jakson Group was the speaker for the talk. His talk revolved around various aspects of renewable energy and its application across the globe. 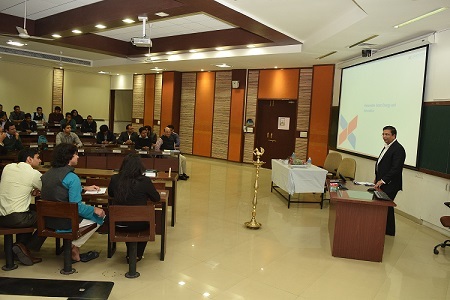 The talk began with the lamp lighting ceremony by Mr. Gupta and Professor Rishikesha T. Krishnan, Director, IIM Indore. Sharing his own experience while working in the industry, Mr. Gupta revealed how various events like the recession, fluctuations in the global prizes, etc. helped him learn the tactics of work. 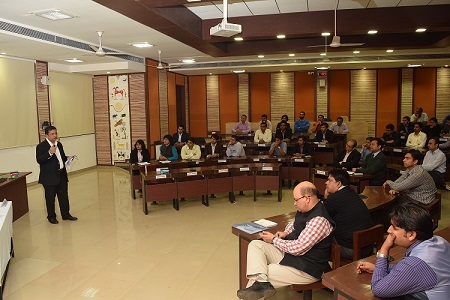 ‘Work for what you aim for and always invest in long term objectives rather than looking for short term profits’, Mr. Gupta advised the participants. Sharing a historic snapshot of global energy mix during his presentation, Mr. Gupta conversed about the shift in the utilization of non-renewable and renewable resources of energy. ‘In the year 2015, we were emitting around 30-32 billion units of carbon dioxide in the environment and this has remained constant in the last two years. This indicates that economic growth can be attained in a sustainable manner, without disturbing the environment. He noted that climate changes and global warming are some challenges which need to be taken care of immediately as they may lead to health and survival issues. Mr. Gupta then discussed about the various resources being used worldwide for electricity production, and noted that the use of natural gas has amplified and coal consumption has gone down. ‘The developing countries are today investing as equally as the developed nations in the renewable energy. The advancement in technology and research & development has led to various solar innovations, resulting in the fall of solar module prices from 76$ to just 0.30$ today. Sharing the figures of renewable electricity generation targets for India, Mr. Gupta noted that the target for the year 2022 is to generate 175 GW of total renewable energy—which includes 100 GW from solar energy, 60 GW from wind energy, 10GW from bio-energy and 5GW from small hydro energy. ‘It is now time to elect our choices for saving the environment and the kind of resources we use for electricity and transport purposes’, Mr. Gupta said. He concluded his talk discoursing about various solar novelties like solar rooftops, solar cells, solar ink, solar film, solar CSP (concentrated solar powers), solar roads and solar airplanes, which are going to be the future of energy production. About Mr. Sameer Gupta: Mr. Gupta has played an instrumental role in growing Jakson Group from a few crores to a 3000 cr+ turn-over conglomerate, having a portfolio of businesses around power solutions. Mr. Gupta has maintained important positions of responsibility with CII and IGBC (Indian Green Building Council).